series parallel circuit are two type , it is in electrical circuit and magnetic circuit . but in both case connection method are being same. In case of parallel circuit , if any circuit have two component , both component are connect at same place it called parallel connection. according to diagram we easily understand. Practically all transformers and generator or other electrical machine use magnetic material for shaping and directing the magnetic fields which act as medium for transferring and converting energy or power. In electrical machines, ferromagnetic materials may form the magnetic medium (for example. Rotating machines). Magnetic circuit is those parts of devices that employ magnetic flux to either induce voltage or produce force. Magnetic flux is the total number of lines of force comprising the magnetic field. The spec occupied by the lines of force around the magnetic circuit is called magnetic field. The force which drives the magnetic flux through a magnetic circuit is called magneto motive force (mmf). Here are some some word which used in both series parallel circuit . In generator, transformer or any electrical rotating machines, the magnetic material is used to form a core. A Coil of conducting material is wound over the core. When a current is passed through this coil, magnetic flux is produced within the core, the strength of this flux depends on the product of number of turns of the coil and the current are carries. This product is called magneto motive force (mmf). I= current through coil, amperes. 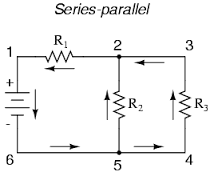 In both case series parallel circuit are same. but some analogy are between electric and magnetic circuit is given below. Analogies between electric and magnetic circuits are easy to be made comparing series parallel electric and magnetic circuits. The closed path followed by magnetic flux F is called magnetic circuit similarly the closed path followed by electric current I is called series parallel electrical circuit. In order to establish the magnetic flux, magneto motive force (mmf) is required which is provided by means of a current carrying winding or coil and this is equivalent to the electromotive force (emf) applied across an electric circuit. The material which forms a magnetic circuit always offers some degree of opposition to the formation of magnetic flux which is known as reluctance R and this is equivalent to the resistance R of an electric circuit is equivalent to voltage gradient or voltage per unit length in electric magnetic circuit is equivalent to voltage gradient or voltage per unit length in electric circuit. In addition of this, following analogies formulas are used in magnetic circuit. In a series magnetic circuit, the same flux flows through each part of the circuit. It can just be compared to a series electric circuit which carries the same current throughout. In a similar manner, a parallel magnetic circuit has more than one path for flux and again it can just be compared to a parallel electric circuit which has more than one path of electric current. A series magnetic circuit that has parts of different dimensions and material is called a composite circuit. Now let us consider a composite magnetic circuit consisting of three different magnetic materials of different relative permeability’s along with an air gap as figger. Each part of this circuit will have its own reluctance. 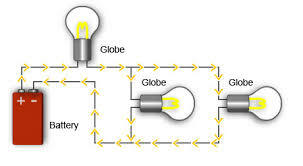 It is a series circuit because same flux has to through all the mediums. This circuit has two mediums one is iron and another is air. According to the dimensions, iron core has three different dimensions. AS stated before, a parallel magnetic circuit consists more than one path for flux. As shown in figger , there are two path of flux , hence it is a parallel magnetic circuit. Since all the flux produce by the MMF will not be confined to the core, some flux will complete their paths largely through air hence this flux offers a reluctance which is much higher than to the reluctance offered by the core. Alough it is negligible flux but if it is taken into consideration, it gives a practical magnetic circuit. This is also parallel magnetic circuit. Hence it is the series parallel circuit in magnetic circuit. If you will find any incorrect in this article please comment below. For knowing more about series parallel circuit pleas sea this video.